The grizzly bear is a majestic creature that inhabits western Canada and the northwestern United States. These large mammals are essentially the king of the animal world. They triumphantly sit at the top of the food chain. These omnivores have a fierce reputation and perhaps deserve the scientific name of Ursus arctos horribilis. The US Fish and Wildlife Service lists grizzly bears as a threatened species. In the past, approximately 50,000 grizzly bears roamed North America. That number dwindled significantly due to human interactions. After recent conservation efforts, there are approximately 1800 bears in the Lower 48 states. National Geographic estimates that there are between 600 to 1000 grizzlies living in the 22.5 million acre Greater Yellowstone Ecosystem including Big Sky, Yellowstone, and Grand Teton areas. Yes, that means there are lots of grizzly bears in Big Sky's backyard. The grizzly bear is the official animal of the state of Montana since 1982. Lewis and Clark name the bear species the "Grizzly." Grizzlies can vary in color from light cream to brown to black. Grizzly bears can weigh upwards of 800 pounds and can measure 5 to 8 feet long. They live about 30 years in the wild and 40 years in captivity. These bears inhabit prairies, mountains, meadows, forests, and even towns. Grizzlies have rounded ears and a short face. They are distinguished from black bears by a hump on their back. The hump is a mass of muscles used for digging. 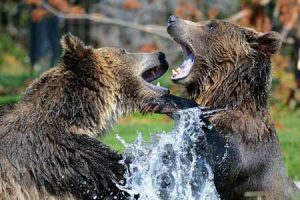 Grizzly bears communicate with sounds, movements, and smells. Grizzlies will rub trees to leave their scent and hair behind. Grizzlies can detect food from miles away. Grizzly bears hibernate during the long winter months. Sometimes they sleep 7 months a year. Females are not able to reproduce until 4-5 years. After mating in the summer, the embryo goes through "delayed implantation." This process ensures that the bear is able to gain enough weight before hibernation to ensure a successful pregnancy. Gestation varies from 180 to 270 days depending on the delayed implantation. During hibernation their heart rate slows from 40 beats per minute to 8 beats per minute. They do not go to the bathroom at all during hibernation. Female bears can give birth to cubs while sleeping - usually in January or February. Cubs are born blind, hairless, and toothless. 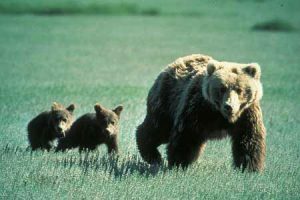 Litters of grizzly cubs range from 1 to 4 cubs. Cubs stay with their mother for 2-3 years. Half of all cubs do not survive past the first year. Mothers are very protective of their cubs. They are omnivores and will anything that is nutritious - nuts, fruit, leaves, roots, salmon, rodents, sheep. A grizzly's claws are about the size of a human finger. Grizzlies can run up to 35 MPH (50 KMH). In general, grizzly bears try to avoid humans. When you are in grizzly country always be bear aware. Practice safe travel tactics in the backcountry. Make noise. Travel in groups. Always carry bear spray. Properly store your food in bear country. People explore bear country every day and encounters are rare. If you do encounter a grizzly bear in the wild, use extreme caution. Try to keep your distance. Avoid eye contact. Appear large. Back away slowly. Be prepared to use bear spray if necessary. Learn what to do in the event of a grizzly bear attack here and here. 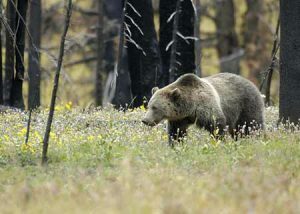 Grizzly bears are frequently seen by humans in Big Sky country and there are rarely any issues. They can be spotted on the hiking trails, crossing the golf course, or wandering down the road in Yellowstone National Park. 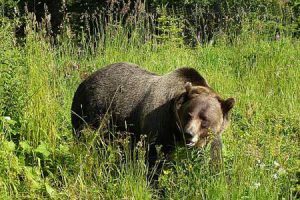 One fantastic place to safely see and learn about grizzly bears (and wolves) is the Grizzly and Wolf Discovery Center in West Yellowstone.